Historian William Friedheim uses before and after photographs of Lakota students taken at the Carlisle Indian School to raise issues about Native American identity and assimilation, and demonstrates how examining photographs as primary documents, combined with additional primary sources, shows students how use of evidence creates historical meaning. 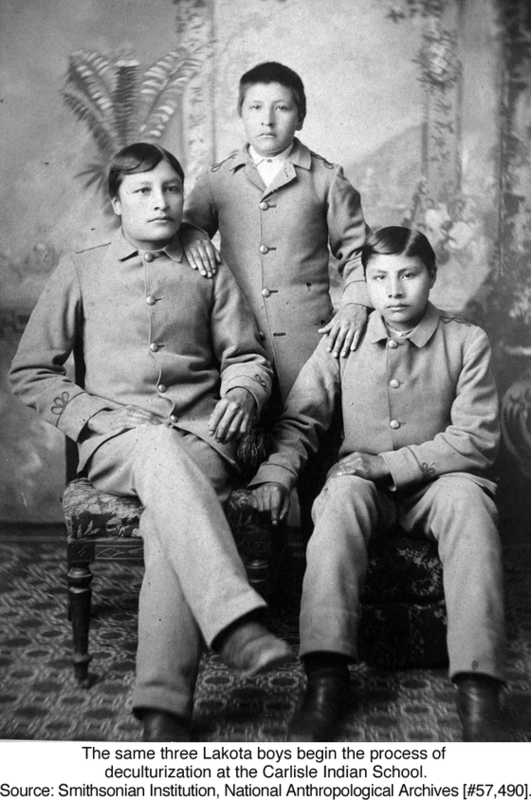 Three Lakota boys on their arrival at the Carlisle Indian School. Source: Smithsonian Institution, National Anthropological Archives [Choate #125]. The same three Lakota boys begin the process of deculturization at the Carlisle Indian School. Source: Smithsonian Institution, National Anthropological Archives [#57,490]. “Kill the Indian, save the man.” These words represent the intended message of these two photographs. The phrase, of course, was made famous by Captain Richard Henry Pratt, a veteran of the Civil War and Indian conflicts, who in 1879 founded what was to become the most famous of the Indian boarding schools at an abandoned army post in Carlisle, Pennsylvania. Convinced that Indians could only survive if they gave up their own values and adapted those of the “white man,” Pratt removed his boarding students from the culture of their parents and tribes. At Carlisle, he supervised the cutting of their Indian pigtails and discarding of their tribal clothes in favor of western dress, ways, and ideas. Pratt saw before and after photographs of his students, such as the two I have chosen, as visual evidence of the process of successful assimilation. But as we know, for many of his students, the boarding schools created a profound identity crisis—and a very different interpretation of the photographs. I see the photographs as an important pedagogical tool—a starting point—for a student exercise in historical investigation of the process of assimilation and struggle at the Indian boarding schools (click here to view the exercise and documents I used). In an introductory modern American history survey course, students examine the pictures with no background material or preparatory reading. In effect, I ask them to make an educated guess—to develop a hypothesis or a story—about the who, what, when and where of the photos. I do, however, give them a primer on how to interrogate photos. My students have always found these particular photographs fascinating, examining details and trying to figure out what is the relationship between the two images. They share their observations on an electronic discussion board, debating interpretations of what they see and brainstorming what else they need to find out in order to explain and put the pictures in some meaningful context. 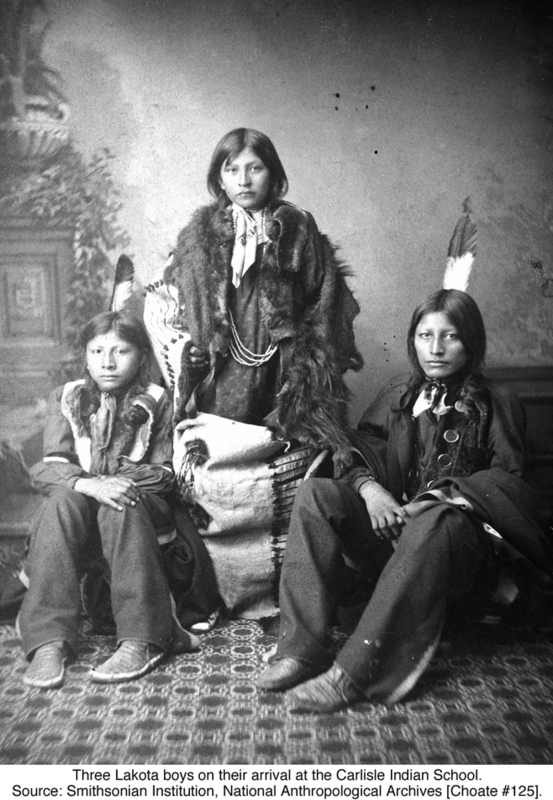 Grappling with questions of authorship, presentation, purpose, and intended audience, and examining the body language, expressions, and positioning of the people in the photographs, students generally locate the images in the late-nineteenth century struggle over Native American culture and identity. I then direct them to a website that identifies the pictures. Next, I give them a series of short documents that I make available on the Web—text, images, and oral history—to help them contextualize the photographs and to develop a historical narrative about what happened. My intent is to have students wrestle with the evidence to create historical meaning rather than having someone else interpret it for them. The activity, of course, does not exactly replicate the experience of the professional historian in the archives. But, in a structured way, it gives students a sense of the historical craft and research. The primary documents they access are (1) chosen by me, and (2) are easily retrieved from the Web. This structure or scaffolding makes the assignment doable in a relatively short period of class time. Yet it is the before and after photographs that initially hook the students, precisely because they present a mystery and suggest a story that starts them on an adventure in historical detection.